What does a week with Henri Bortoft look like? 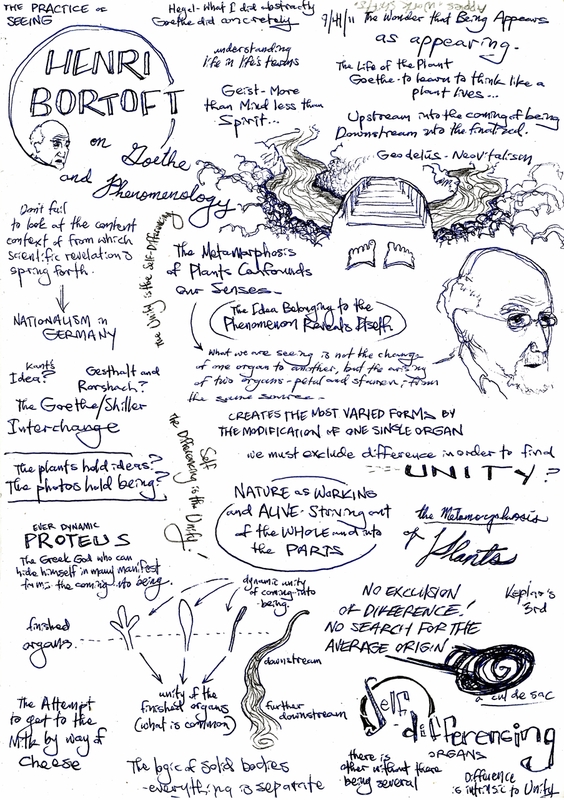 These are some of my first Holistic Science notes that I took at the Schumacher College in Devon, England. The late Henri Bortoft joined us on our first week of focused study and took us on a journey through and introduction to phenomenology and the science of Goethe. These notes are a collection of the images and words that he shared with us and point towards topics and facts and ideas, yet defy a logical form of explanation. Henri Bortoft was a massive inspiration for many of the students of the Schumacher College. I brought his work into many of the papers that I wrote during my year of study. This was especially the case with my dissertation where I related the concept of authentic wholeness to upcycling as well as community engagement and activism. Two years ago Jo initiated a project in South Africa to “upcycle” an old dumping site into the home of the Trash to Treasure Festivals. His passion to show people how they can use “trash” beneficially for the betterment of their communities. He was recently was accepted to the Sustainable Cup Challenge Fellowship in New York City with The DO School. His aim is to build upon the work that he accomplished in South Africa and establish an eco-brick program in Santa Fe that addresses local plastic pollution.